Patrangasava is an ayurvedic medicine used for restoring the women’s health. It helps to treat leucorrhea, dysmenorrhea, and excessive uterine bleeding. It is also helpful for the treatment of anemia, loss of appetite and anorexia. In addition, it improves body strength, endurance, and stamina. It restores digestive functions and improves appetite. It is the best medicine for women when they have weakness and feel fatigue after a short work. Mostly, these symptoms are associated with other health problems like leucorrhea or abnormal discharges. Take Water in Asava Vessel and put Dhataki Flower, Munakka, Sharkara, and Shahad. Take all other ingredients and mix them in above mixture. Leave it for 30 days in Asava place. Then decant the liquid (Patrangasava) and preserve it in food-grade bottles. The main action of Patrangasava is observed on Pitta Dosha. It also pacifies Vata Dosha. Patrangasava is helpful in following health conditions. The general dosage of Patrangasava is as follows. Patrangasava is considerably safe for most individuals. There are no side effects observed with Patrangasava. There are no absolute contraindications for Patrangasava. 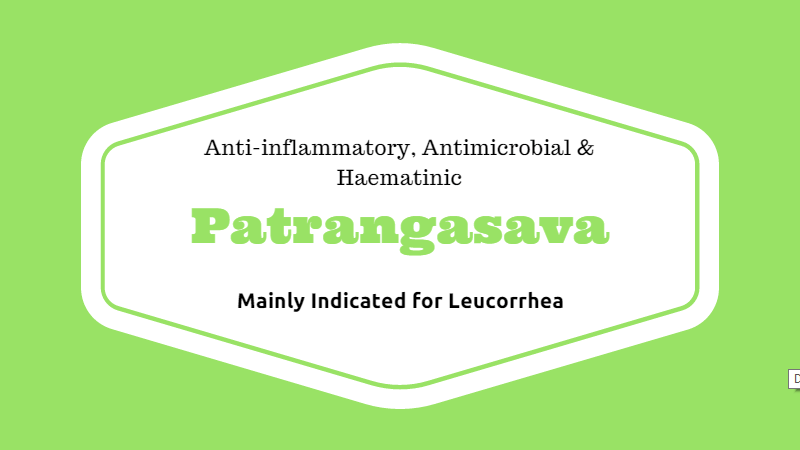 The safety profile of Patrangasava is not well established for pregnant women and lactating mothers.